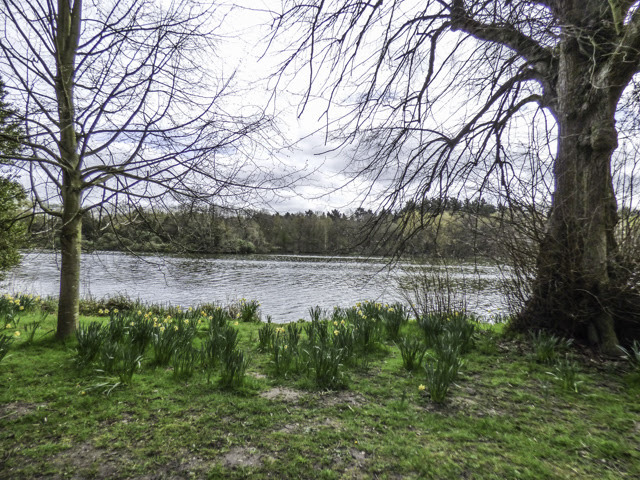 Yesterday's Wordless Wednesday post showed photos of our day out last week at Clumber Park in Nottinghamshire. 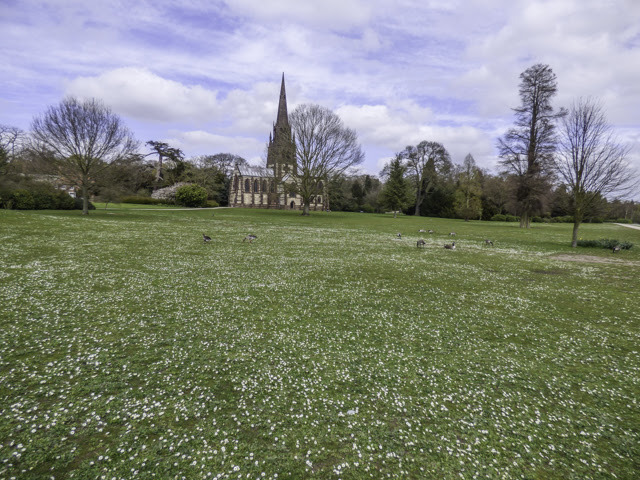 For the sake of poetic licence I hinted that that the impressive carpet of daisies was at risk of being mowed down by the geese. In the interest of fairness let me put the record straight. 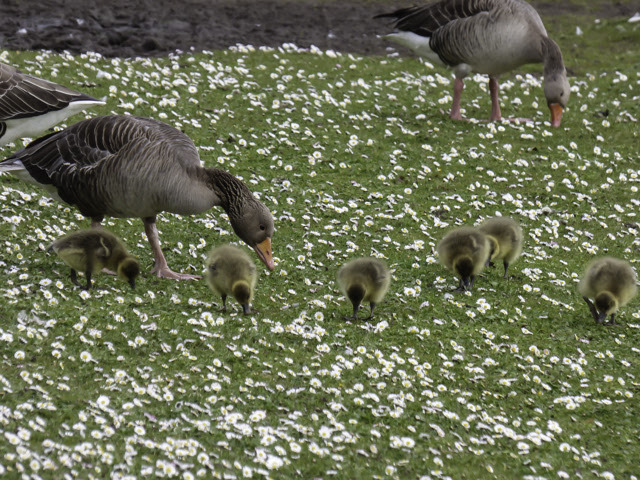 As you can see from the photo below the geese make little impact on the daisies. 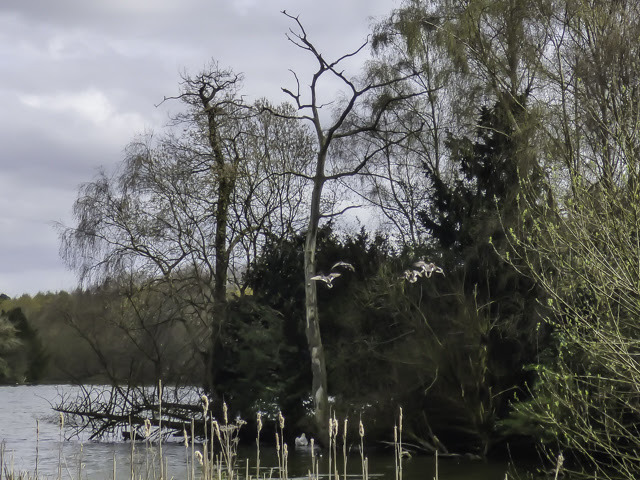 The geese in the photo were greylag - our largest resident goose. 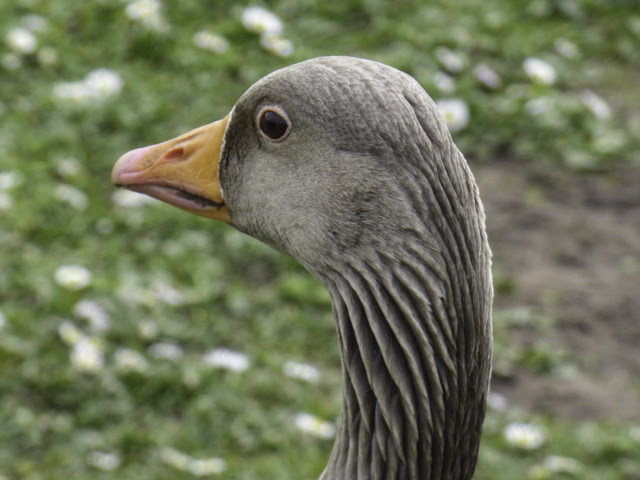 There were also Canada geese, swans and ducks browsing the grass but the greylags were the only ones with young. 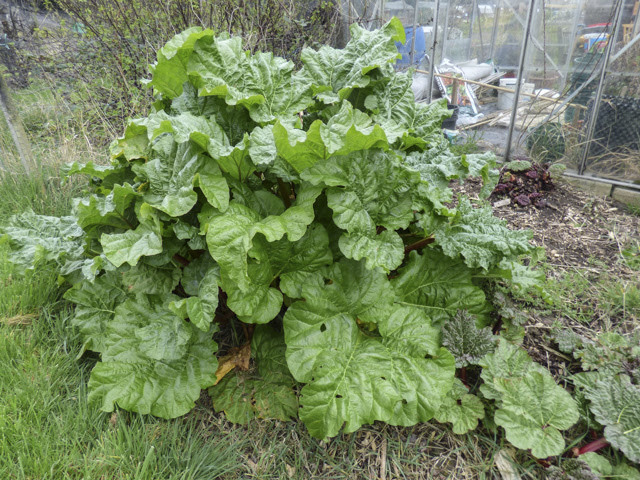 Often when I post that we are pulling rhubarb I will receive comments from readers saying their rhubarb is nowhere near ready and I always reply that it depends which variety is grown. 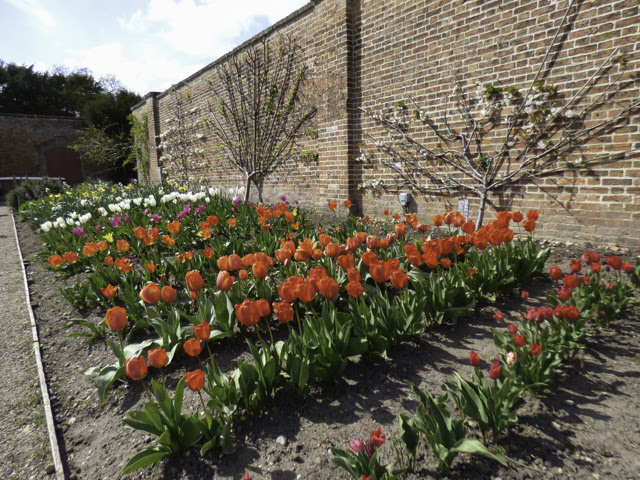 In the Clumber Park walled kitchen garden with over 130 varieties they boast the second largest collection in the world. I wonder who has the largest. It was comforting to see that we were not too far behind them with our vegetable planting although they did have broad beans flowering whereas ours are still in the greenhouse. 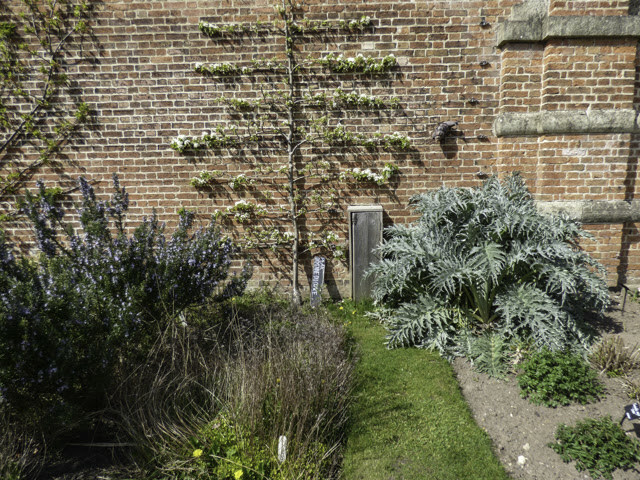 I really like the espaliers and fan trained fruit trees. 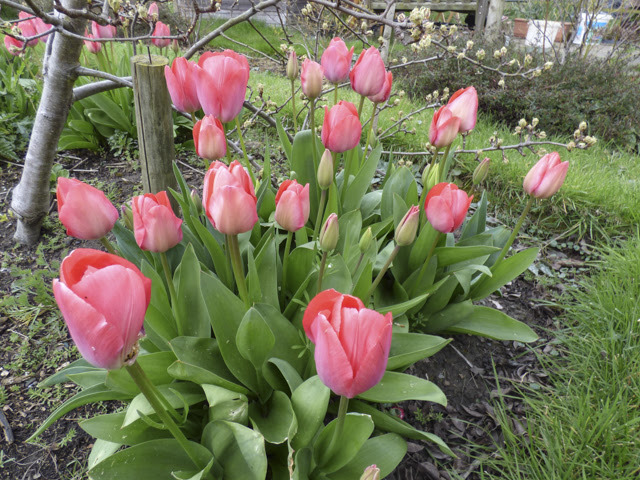 The main interest was provided by the tulip display. 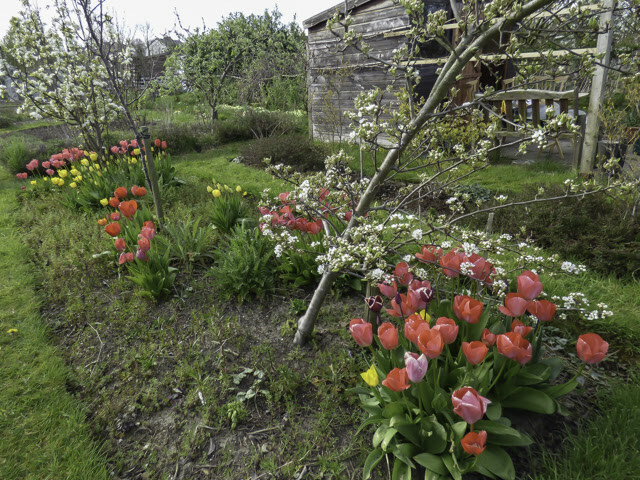 Our tulips are not quite there yet. and our white and blue one. I was so absorbed in my work that I didn't notice that one of our plot friends and his dog had walked right by me. Later when we were sharing a coffee break he said, "You were in the cage so I didn't speak as I was worried that I would make you jump and you would hit your head." Martyn hasn't yet started to lock me in a cage - the cage in question was the makeshift fruit cage that covers our redcurrant bushes. 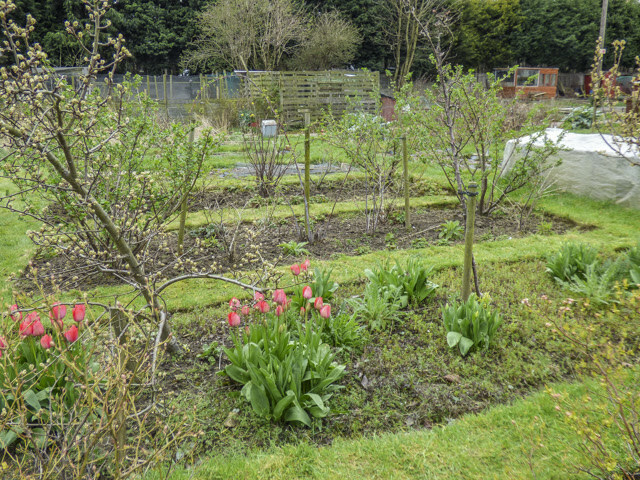 The ground is covered with weed control fabric and mulched but annual weed seedlings and fallen redcurrants germinate in the mulch and need clearing once a year. 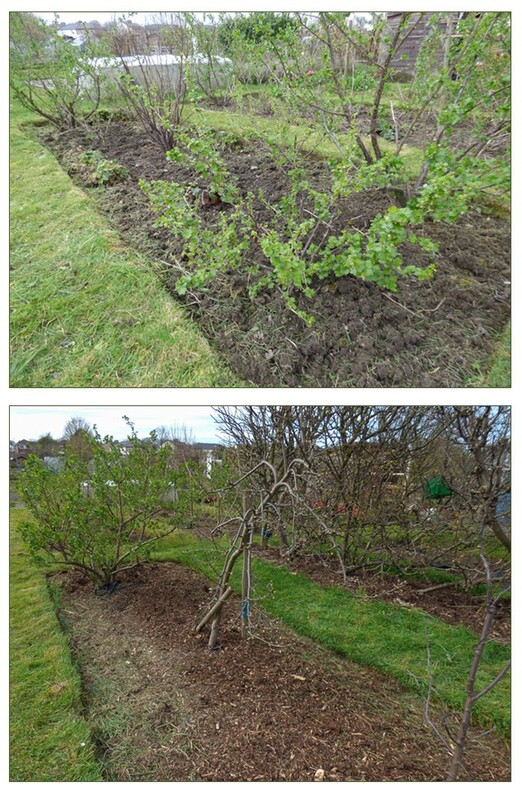 Normally this would be done before the bushes start into growth but, like everything else, this task has been delayed this year meaning that I had to crawl about under, not only leafed but bushes with fruit already set. I dread to think of the view our friend was treated to as he passed. 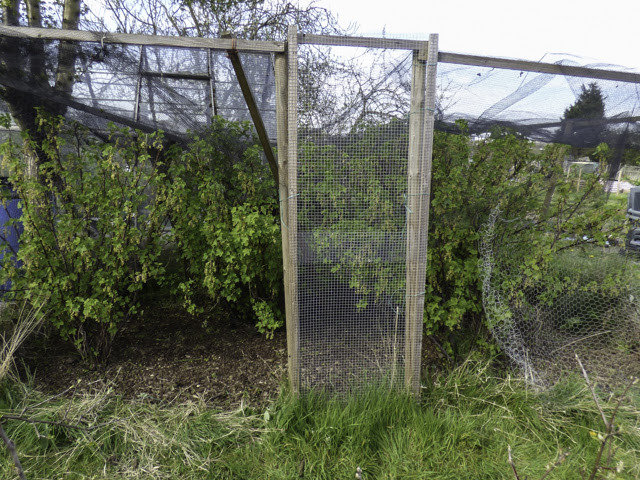 Anyway the job is done and now we only need to reattach the wire netting to the front of the cage. This was removed to enable easier access. 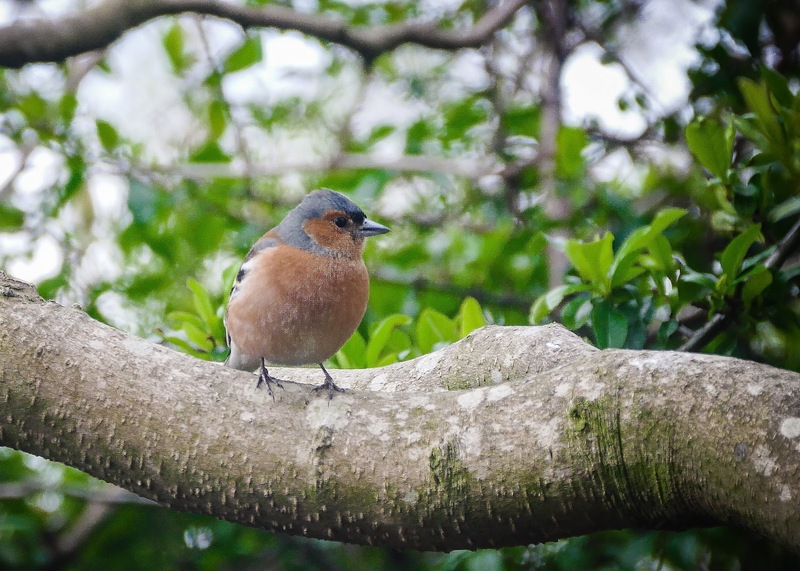 Each year, these old bushes that we inherited, provide us with a good crop and signs are that this year will be no exception. Whilst I was scrabbling about on my hands and knees, Martyn was planting our trial potatoes. We bought five tubers each of six varieties that we have never grown before. It is great to be able to buy samples so we can test whether we like them before planting a whole bag of a new variety. We are trying Armour, Blue Belle, Setanta, Orla, Vivaldi and Valor. The thirty tubers just filled a small bed and of course are all carefully labelled. 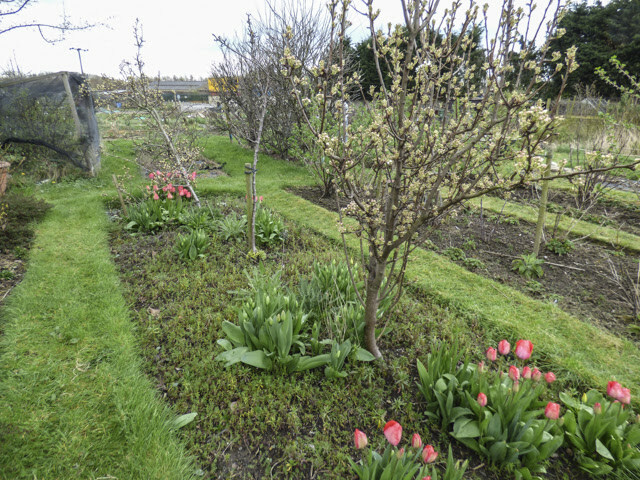 We managed more weeding and bed preparation but as the forecast is for some rather unpleasant weather we deferred planting anything. I am sure, like us, the plants like shelter and will prefer the protection of the greenhouse or cold frame. 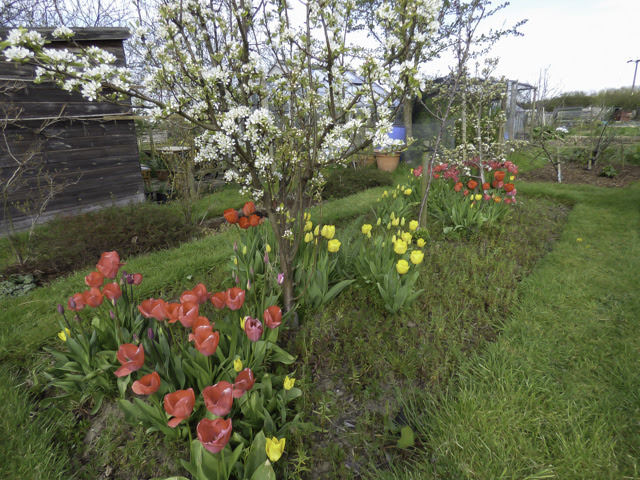 Yellow tulips have now joined the red ones in the pear bed I showed in an earlier post. The ground cover of what looks like weed seedlings is actually self sown annual flower seedlings - mainly candytuft. 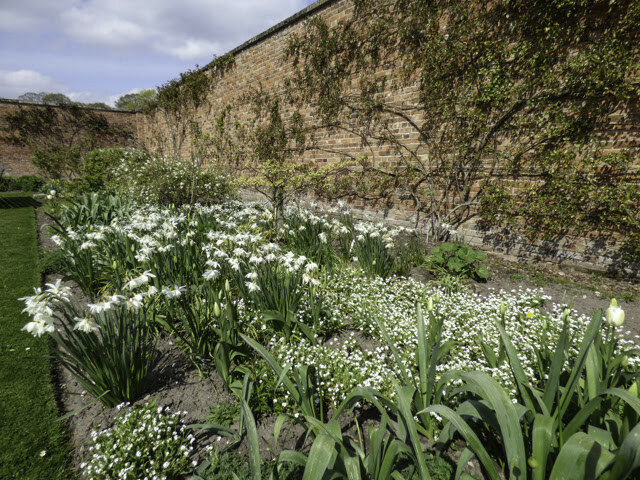 There are one or weeds that will need pulling out but the candytuft makes a good job of keeping the weeds at bay. 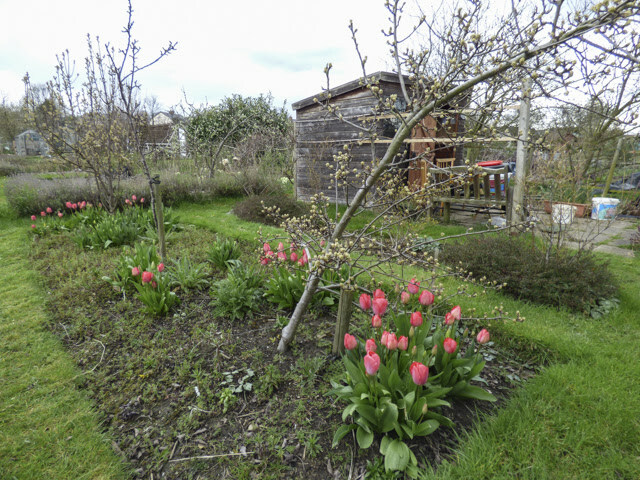 Two pear trees were flowering when we left the plot. I say, when we left the plot, as I am sure only one had open blossom when we arrived. 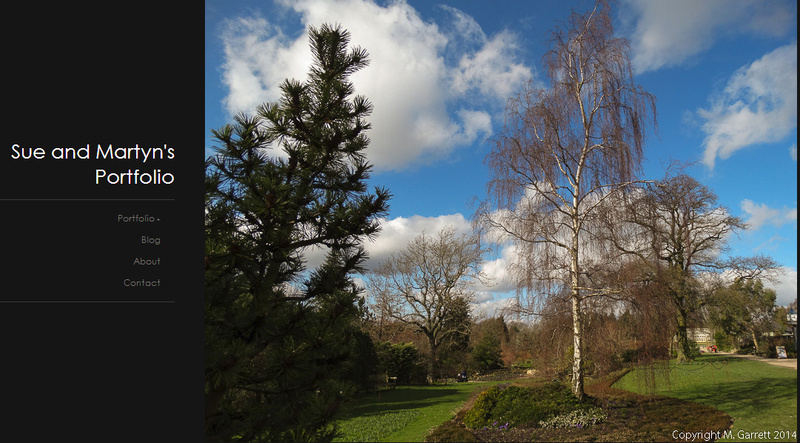 The tree in the foreground above seemed to open in the afternoon's sunshine. 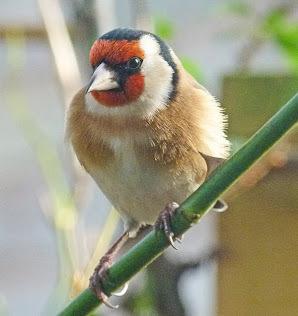 I just hope the insects have been busy and made the most of the warm conditions before they take a turn for the worse. For various reasons, not least of which is the poor weather, our growing season has been off to a steady start. We have, however, made some progress and the garden greenhouse and cold frames are taking on tenants. We have onions and shallots at three different stages. The first lot planted are in one of the cold frames and will soon head for the plot. 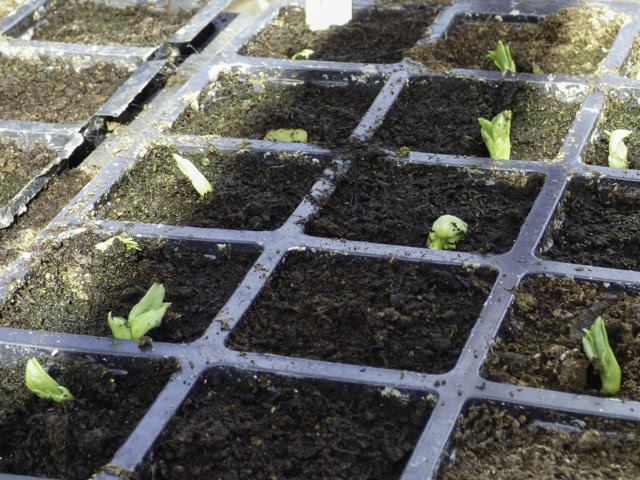 Some planted slightly later are shooting in the greenhouse and a third lot will be planted directly in the ground. 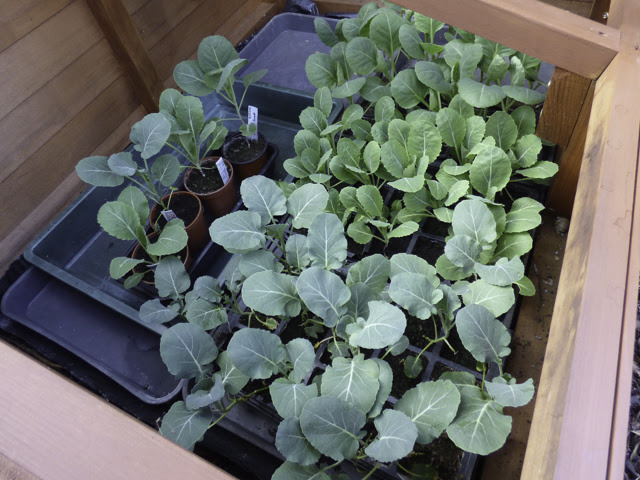 In the other cold frame our early brassicas - cabbage, calabrese and cauliflower - are waiting to be transferred to the plot. Hopefully they will not have to wait much longer. The salad bed in the greenhouse is now growing well. This contains a mixture of pea shoots, coriander, radish and various salad leaves. In the Woodblocx the salads sown in there are moving along far slower. At least we have managed to get some spring onions to germinate, but the radish are slow and so far the salad leaves haven't shown any signs of germinating. We need the temperatures to rise soon. 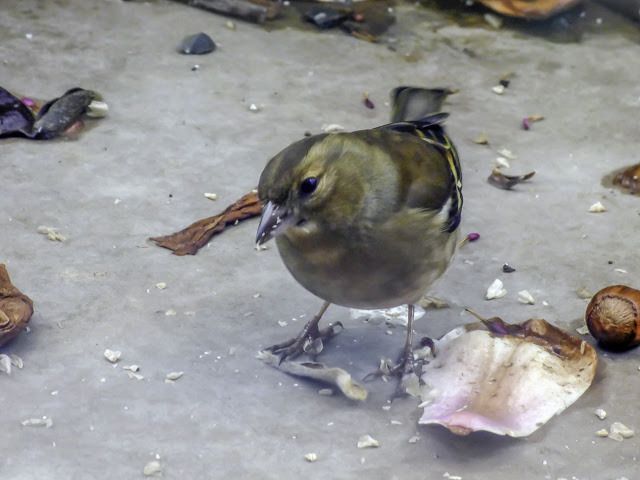 In the greenhouse the broad beans have germinated but are not showing any signs of being in a hurry to grow. Sweet peas are also pushing through. 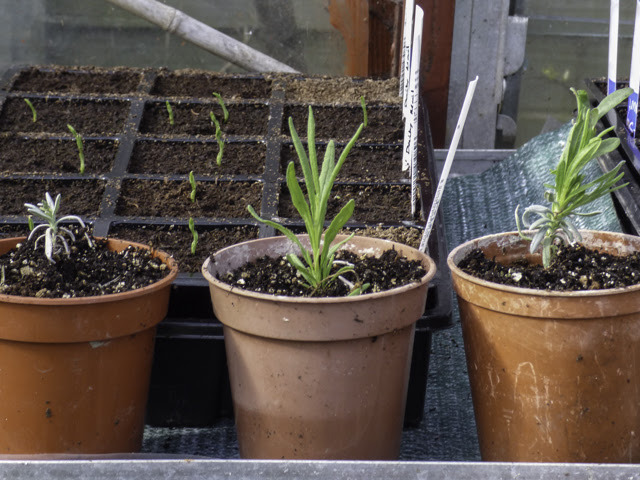 They are behind the recently potted lavender cuttings that were taken last year. 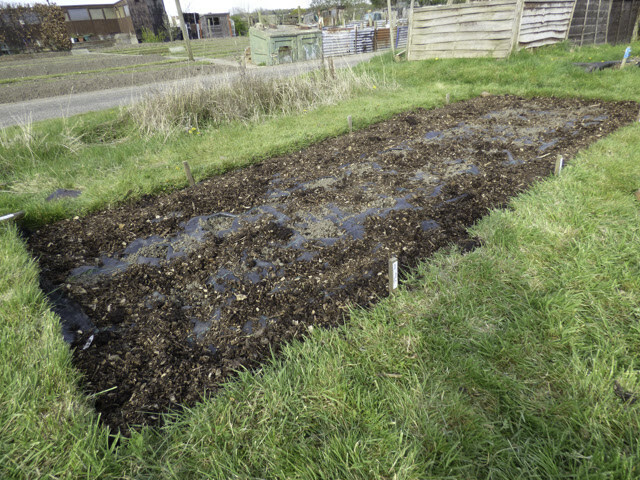 I have also sown the first batch of annual seeds for the plot cutting patch come pollen bar. There are about twenty different varieties. 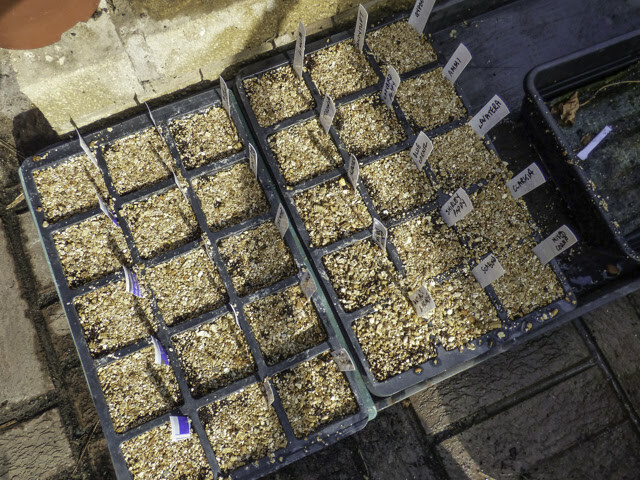 Another batch will follow on as these germinate. This way we should get flowers over a longer period. It's a tense time on the soft fruit front. 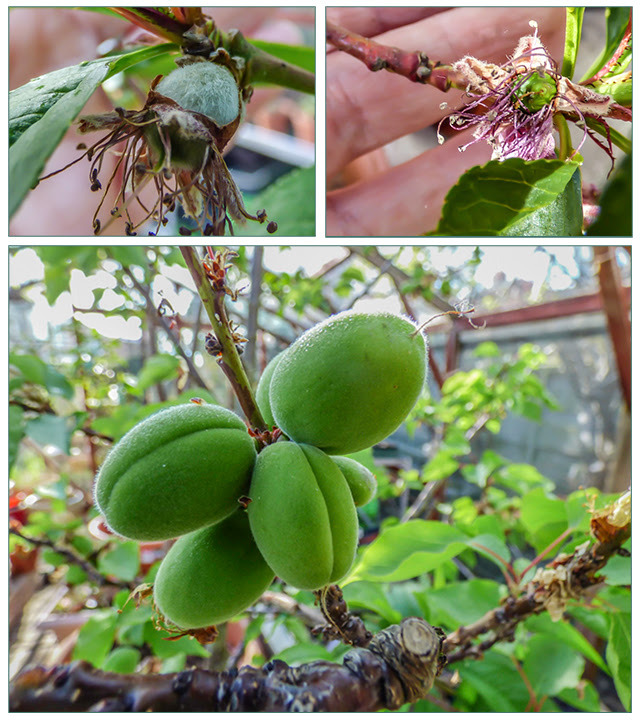 The apricot is loaded with fruit. Some is growing quickly and as expected smaller fruits are being cast. 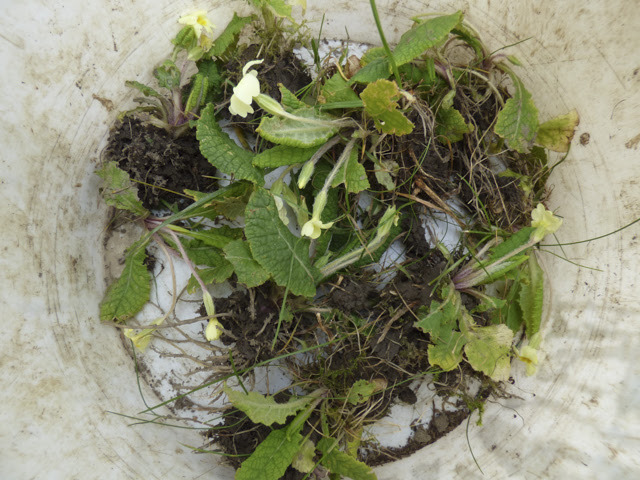 I have removed some of the dead flowers as these were showing signs of spoiling some of the swelling fruits. We need to assess whether we should remove any of the larger fruits. This will not be a problem we have with the peach and nectarine as although there are some signs of fruit setting there will not be very much. We'll be content with a taster but the fruit will need some warmth if it is to ripen. Maybe we will need to invest in a sun lamp! 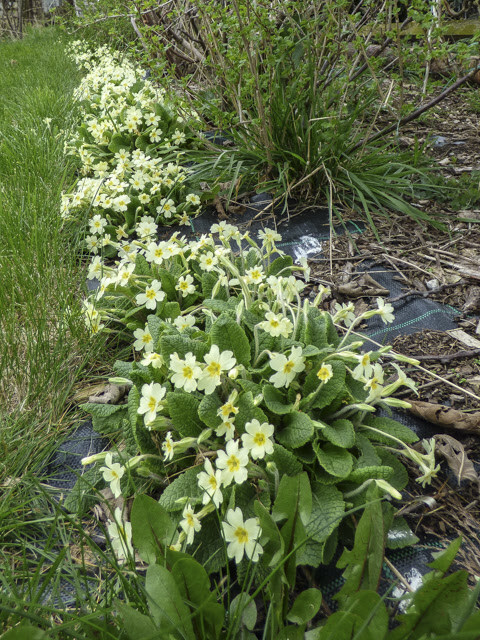 This time of year we always have a lovely display of native primroses on our plot. They originated from about half a dozen plants that I managed to raise from a whole packet of seed some years ago. At this time of year they have to be one of my favourite flowers. 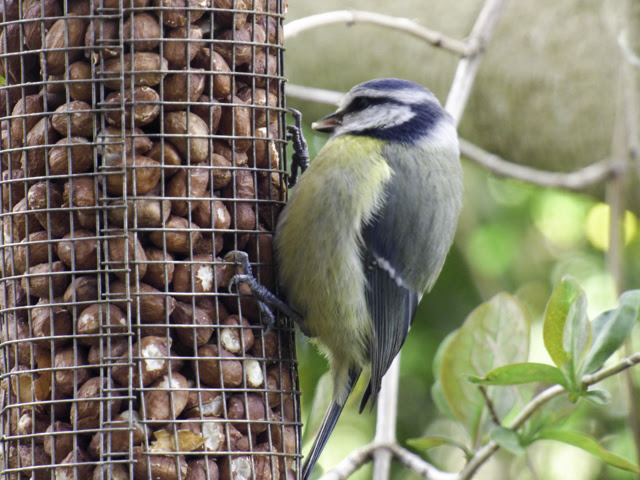 Each year they seed freely - and the seeds germinate far more successfully than I managed from that packet of seeds. 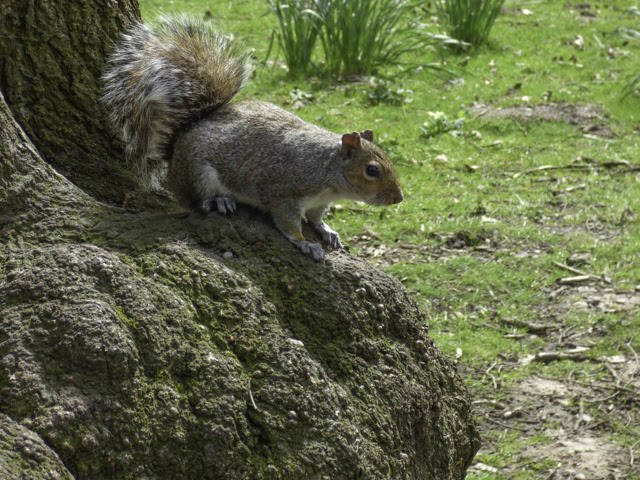 Many grow on the grass paths and are in grave danger of decaptiation by strimmer. 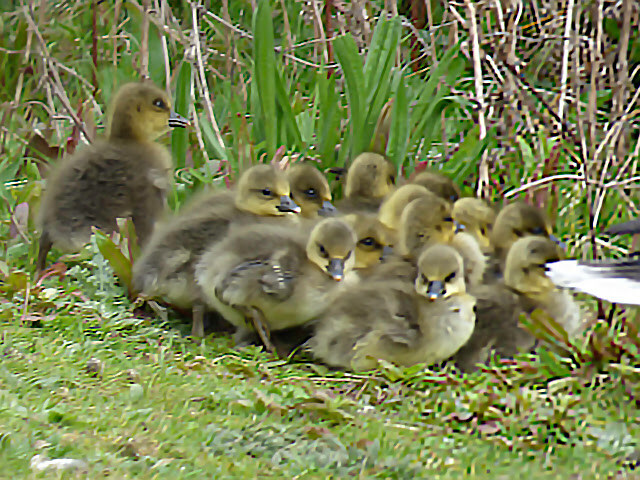 With an eye to preserving the strays, last week I rounded them up and transported them from plot to garden. 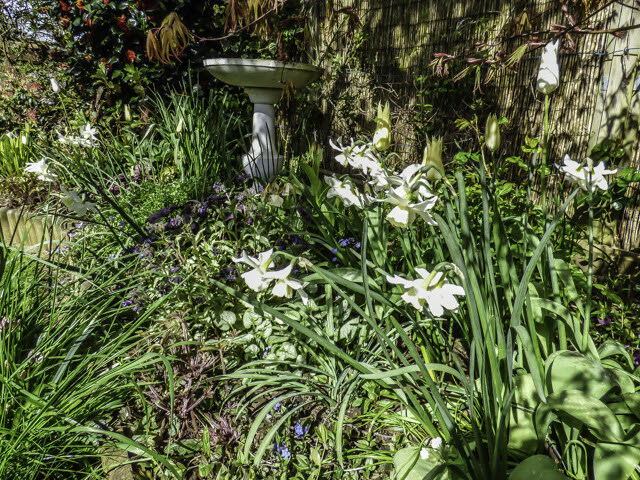 The rescued young plants were planted amongst the hellebores as soon as they arrived back in the garden where I am hoping they will create a colony. 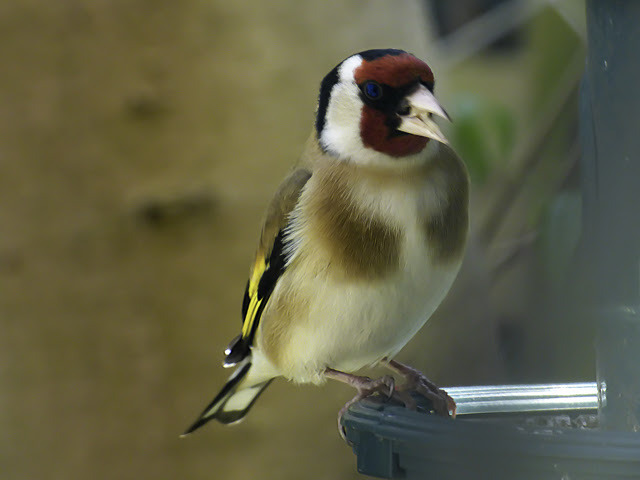 To help them on their way I will scatter any fresh seeds that I can gather from those on the plot. I think sowing freshly is the key to success. The plants don't store seeds in packets until spring do they? 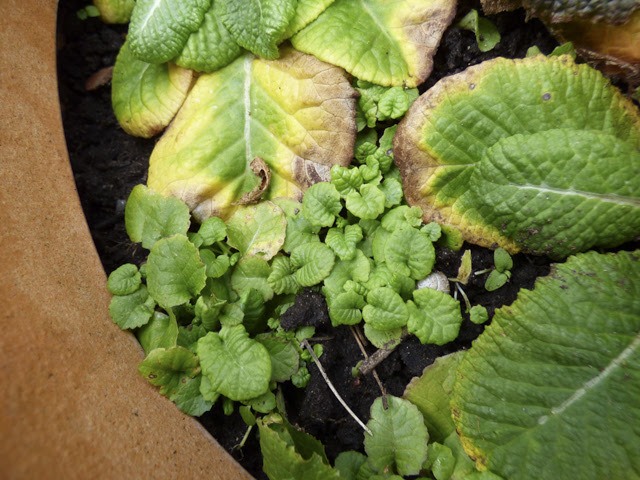 The proliferation of new young plants isn't confined to our native primrose. Last year I bought four cultivated varieties. They too have been busily reproducing. 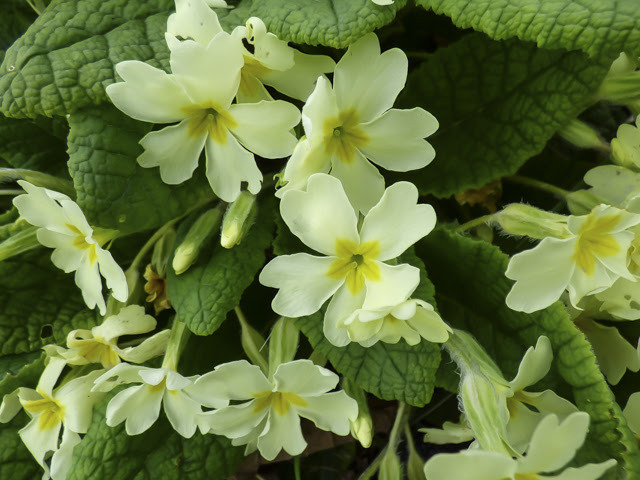 Primroses actually need to be cross pollinated and so if you have only one plant then unless there are other plants close by you are unlikely to have seedlings. 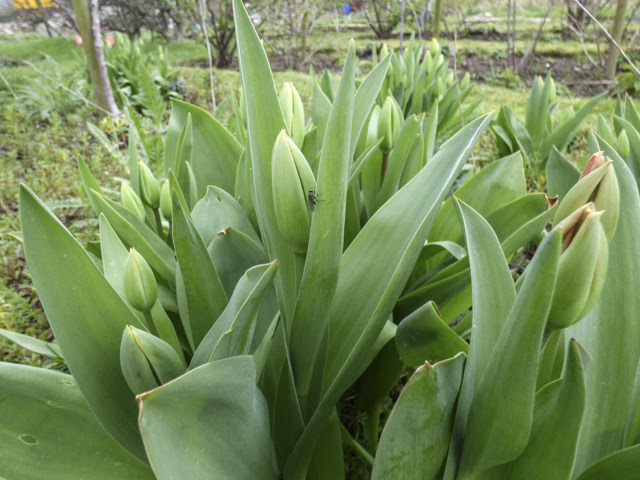 Even two plants or more doesn't guarantee that your plants will produce offspring. 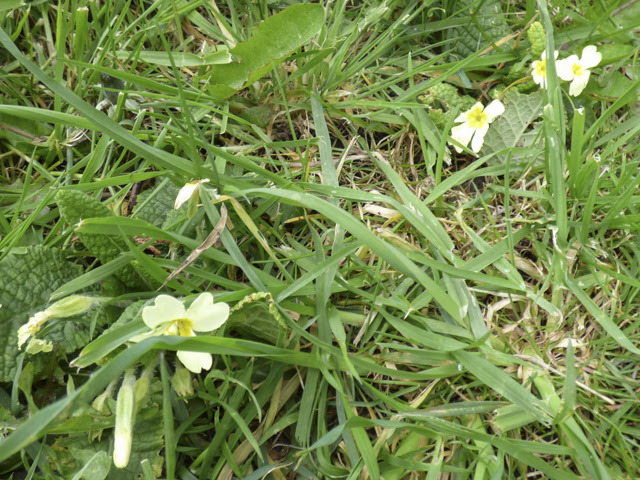 There are two types of primrose. 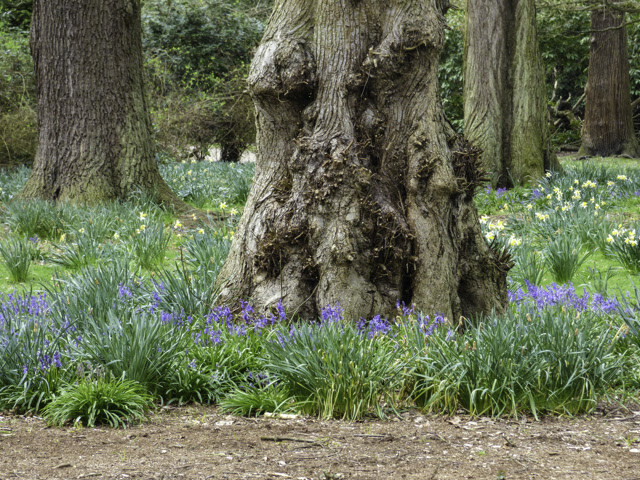 Plants that have pin eyed flowers and those that have thrum eyed flowers. 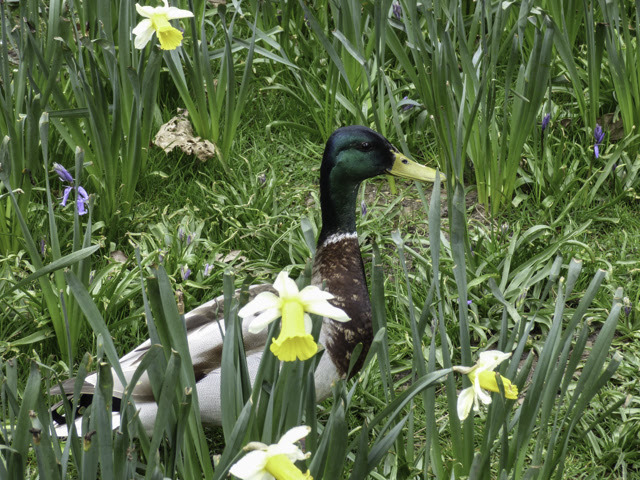 The pin eyed flowers have a longer stigma (the female part of the flower) and this peeps up in the middle of the flower. 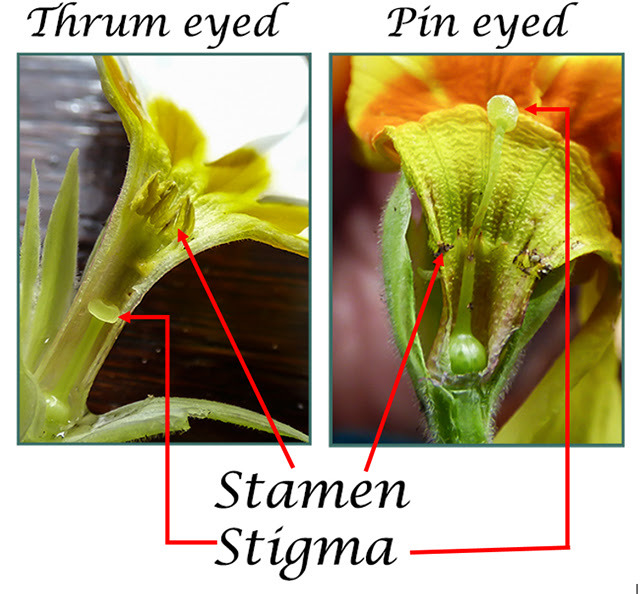 In the thrum eyed flowers the stigma is hidden inside the flower and the stamen (the male parts form a ring near the top of the opening. The flower is pollinated by an insect with a long tongue which will come along and probe the flower for a drink of nectar. Pollen from one type of flower will rub of on the insect at just the right level to be brushed onto the stigma of the other type of flower. The clever trickery doesn't end there as the two types of flower produce different pollen. The thrum eyes flowers produce larger grains of pollen. The grain of pollen grows a sort of tube down from the stigma to the ovary at its base. 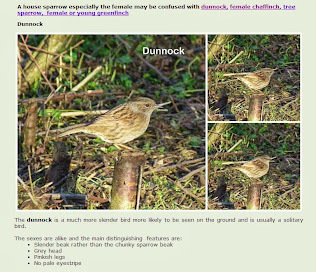 You can see the ovary very clearly in the photo on the right. This has to happen to fertilise the seeds in the ovary. 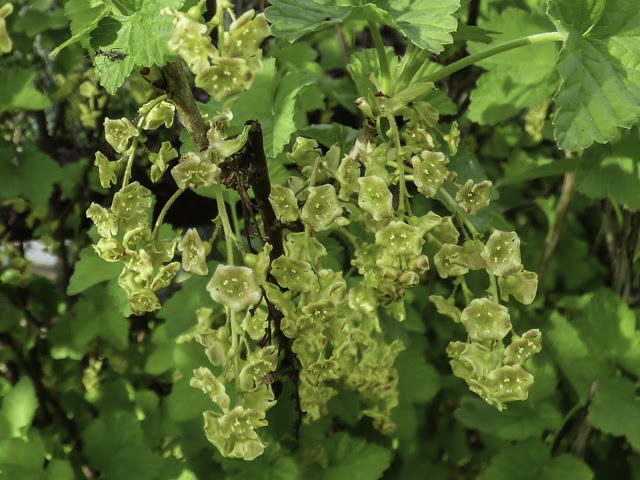 In the case of the pin eyed flowers, the grain of pollen has to grow a longer tube and work harder and so the grain of pollen supplied by the thrum eyed flower has to be bigger and have more vigour. 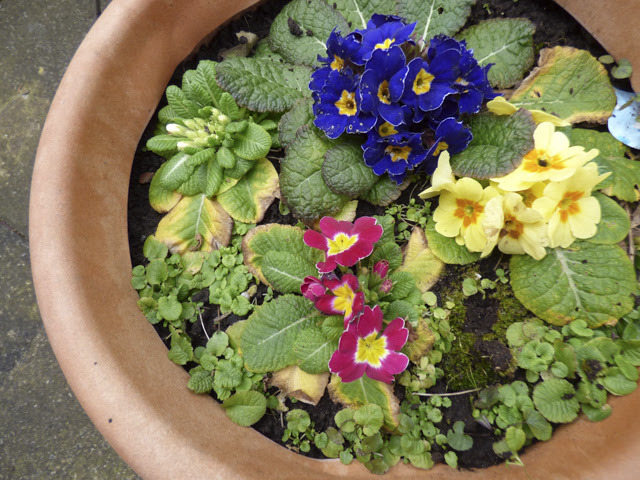 It was a bit of luck that of the four hybrid primroses bought last year, two are pin eyed - the blue and yellow plants - and two are thrum eyed - the red and white plants. I wonder what colours the flowers of the young plants will be? 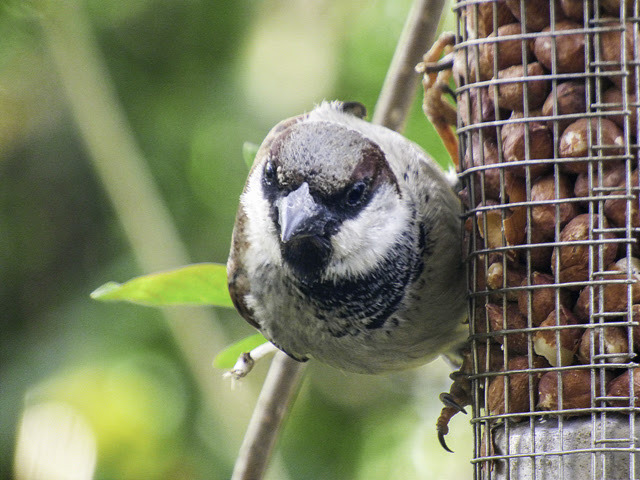 For reasons explained in Martyn's blog, it's been a while since we have managed a good weekend on the plot and things are moving on a pace - in some cases without a great deal of intervention from us. 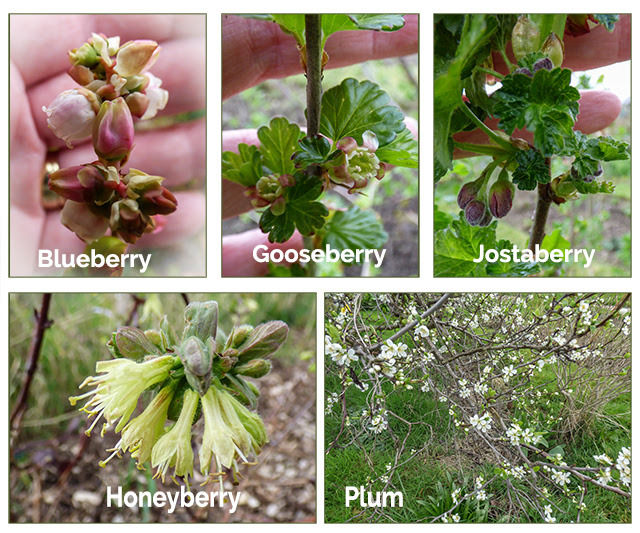 Some fruit bushes and trees are kicking winter into touch and producing flower buds and in some cases flowers. 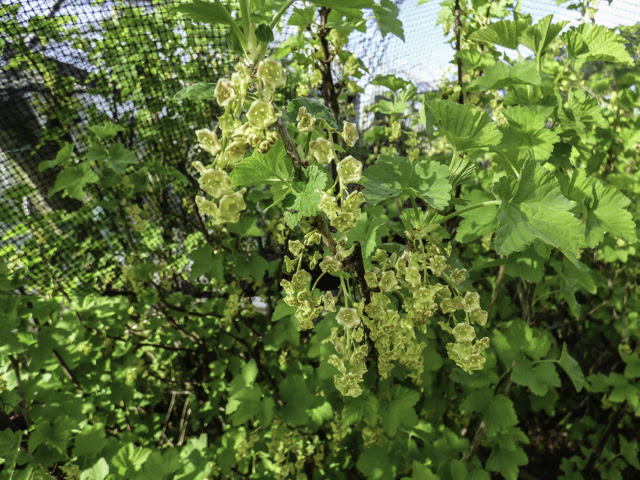 I wonder whether we will have the opportunity to taste honeyberries this year to assess whether they live up to the glowing reports that I have read. Although we use weed control fabric on potato beds we have decided to leave the earliest producers uncovered so that we can access the early crop more readily. Unlike beds containing later crops that tend to be harvested at the same time, the early roots are dug as we need them for the kitchen. The first lot of seed potatoes - Casablanca were planted at the weekend. 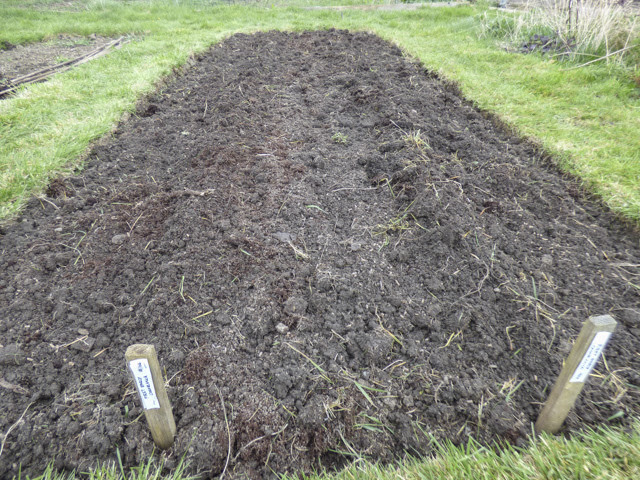 Other beds have been prepared so they are ready for our next lot of planting. 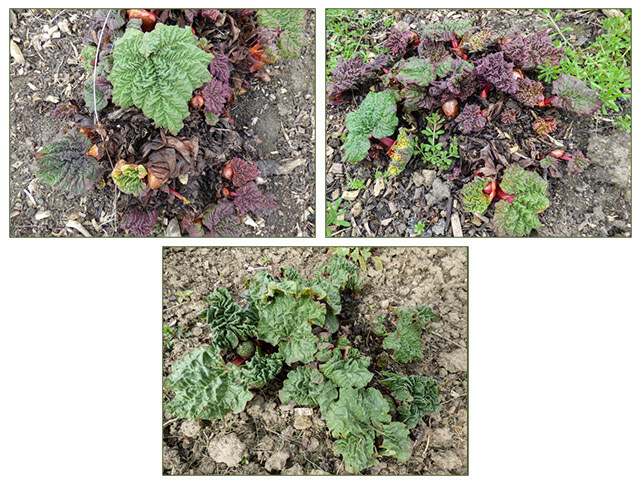 They early rhubarb - Timperley Early has grown well and is nearly ready to pull. The later varieties are at the knobbly/crinkly stage. 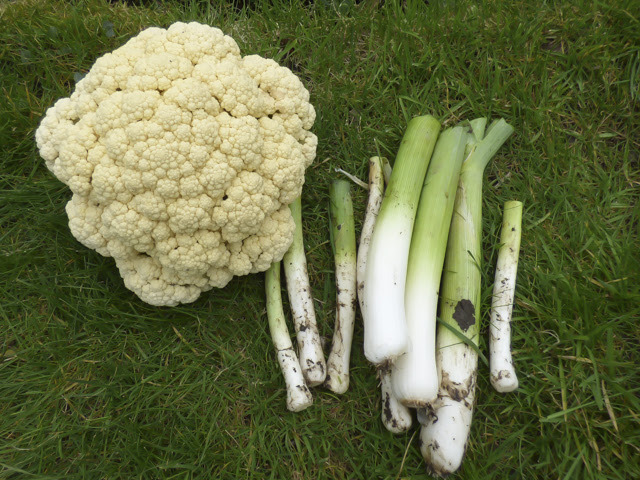 We are still harvesting a few leeks and parsnips but a welcome surprise was a lovely big cauliflower. The cauliflower may not be whiter than white but it will still go down a treat. 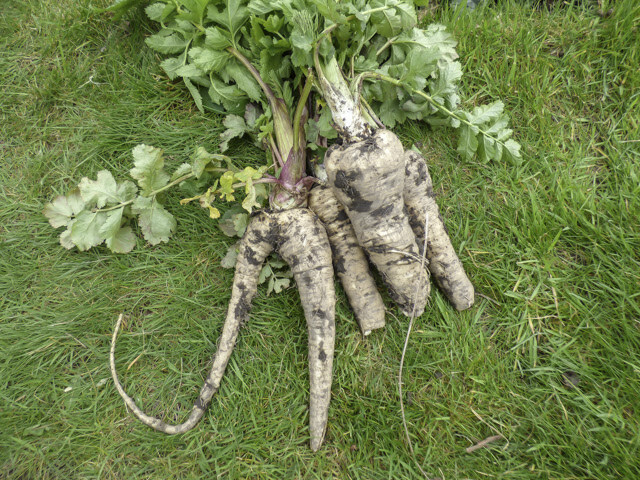 The parsnips are beginning to regrow and so the quality of the roots may be disappointing but there is only one way to find out. 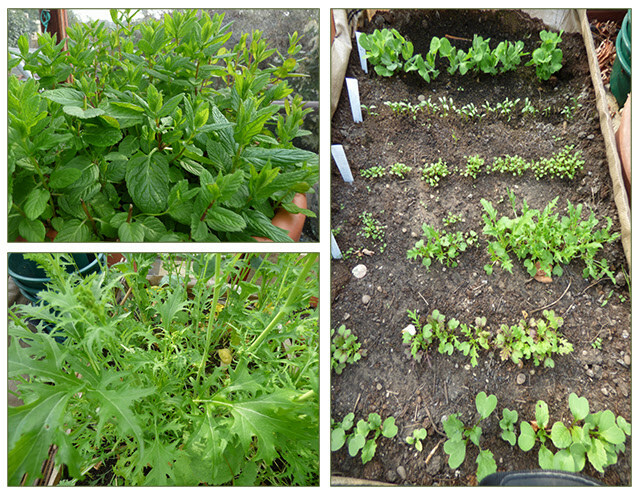 The garden greenhouse is producing a ready supply of salad leaves and mint with more on the way.